When I was plugging songs in the early ‘70s at Warner Brothers music we represented the music of manager, David Geffen’s artists whose roster included the Eagles, Crosby, Stills and Nash, Jackson Browne, and Joni Mitchell. I had known Joni before socially, and respected her talents, but I never knew how deep she was. It wasn’t until my friend, singer/ songwriter Patti Dahlstrom made me sit down and listen to the “Blue” album and read the lyrics did I fully appreciate what Joni was all about. I was so hungry to hear more that when David Geffen sent cassettes to WB music to copyright the songs from the yet to be released album, “For the Roses”, I volunteered to transcribe all the lyrics (which I had never done before). Joni Mitchell’s 10 CD box set showcases the greatest female singer-songwriter in popular music, says Mick Brown. The last few years have not, one senses, been happy ones for Joni Mitchell. Suffering from Morgellons Syndrome, a rare skin condition, she has all but abandoned music altogether. She has not performed in more than ten years, and not released an album since the stately and haunting Shine, five years ago – a record of melancholic reflections on the environment and mankind’s propensity for self-destruction. Once a force of life, Mitchell now seems distinctly at odds with the world. This release, then, a collection of her first ten studio albums, recorded between 1968 and 1977, seems particularly timely. It’s a reminder of Mitchell’s musical genius – and I don’t use the word lightly – and an affirmation of her status as unquestionably the greatest female singer-songwriter in popular music, as major a figure in her own way as Bob Dylan. We’re treading on dangerous ground here. 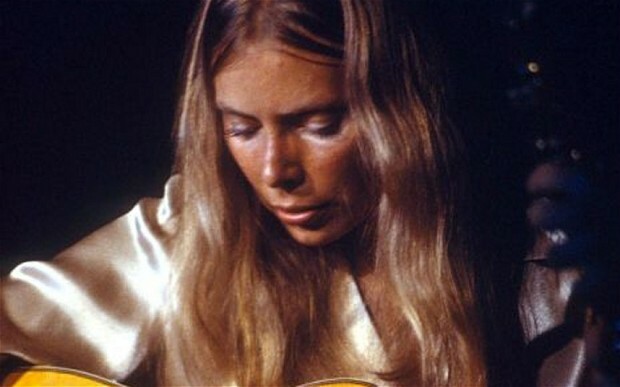 Mitchell has sometimes been described as “the female Dylan” – prompting her retort “why doesn’t anybody ever call Dylan the male Joni Mitchell?” And Bob is clearly a sore point. In her last interview, given to the Los Angeles Times in 2010,she lambasted Dylan as “a plagiarist” and “a fake”. “We are like night and day, he and I,” she said. “Everything about Bob is a deception.” Ouch! Leaving the question of authenticity aside (and Mitchell’s comments surely say more about her cantankerousness than they do about Dylan’s integrity), any stylistic comparison between the two is pretty meaningless, beginning – and ending – with the fact that both began their careers labouring under the description of folk artists. But what they do share is an arresting narrative to their lives which has nourished and illuminated their work. Dylan’s story is written in stone: the Minnesota childhood; hitchhiking across America on a pilgrimage to meet his hero Woody Guthrie; his apprenticeship in the coffee-houses of New York; his alignment with the civil rights movement; “the voice of a generation”; Newport, the motorcycle crash. And so on. Mitchell’s narrative is no less beguiling. The childhood in the Canadian prairie town of Saskatoon; her apprenticeship in the coffee houses of Toronto; an early pregnancy, giving up for adoption the daughter that she felt unable to care for her herself; the migration to California, and her ascent to become the reigning queen of the Laurel Canyon – arguably the first, and certainly the most candid, of the confessional singer-songwriters of the era. While it was true that Mitchell (winner of eight Grammys in all) sang in a folk idiom she was never a folk singer in the way that Joan Baez defined the type – reviving old ballads or singing songs for to fortify the barricades of political protest. Form the outset, Mitchell was a writer as well as a performer, her earliest songs studies of lovelorn introspection.